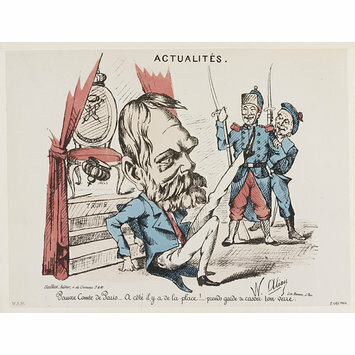 Satirical print in which a bearded man is shown seated on the ground in front of a throne, his left leg raised. Two soldiers watch on the right. Print from a set of caricatures, broadsheets and illustrations in ten volumes. Each volume is half-bound in red leather, gold tooled and stamped with imperial emblems, title etc. 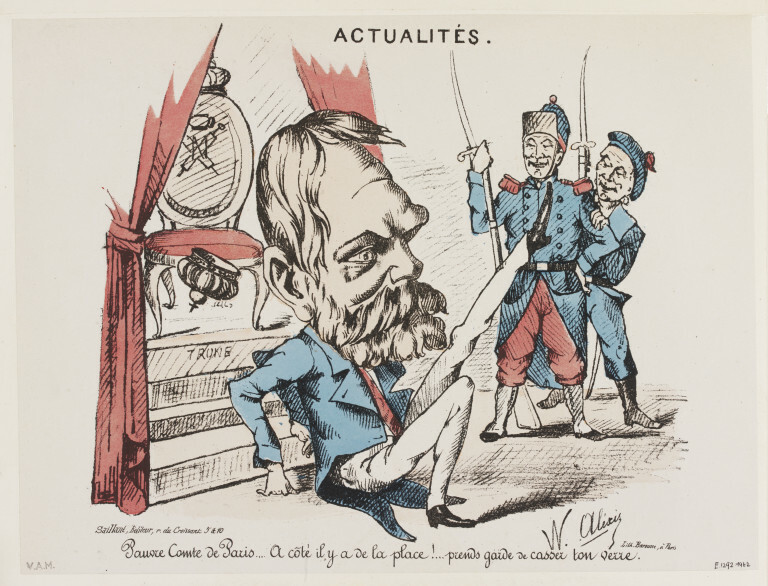 'Pauvre Comte de Paris...' Satirical illustration by W. Aléxis in which a bearded man is shown seated on the ground in front of a throne, his left leg raised. Hand-coloured lithograph, France, 1870-1871. Victoria & Albert Museum Department of Prints and Drawings and Department of Paintings, Accessions 1962. London: HMSO, 1964.